Thanks to netgalley and Penguin Books Australia, I had the opportunity to read and review Journey's End by Jennifer Scoullar before its release later this month. It begins with Kim Sullivan, a mother of two children, Jake and Abbey, who is still struggling to come to terms with the death of her husband Connor two years ago. His death has also affected the children; Jake in particular finds it difficult, and lashes out on his family, friends, and school. Kim makes the brave decision to take the children away for a visit to Journey's End, a property her late husband inherited years prior, located on the outskirts of a town named Tingo, in country New South Wales. She wants to sell the run-down property, but hopes that the time away will benefit them all before she puts it on the market. She meets Ben, the real estate agent, as well as Taj, Tingo's local handyman. 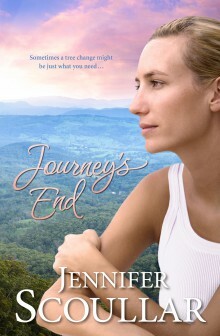 Both men sway Kim's decision to stay at Journey's End, each with different motives. Meanwhile, the children thrive in their new surroundings, however, Kim, a botanist, makes a few enemies when she decides to rewild the land, and introduce dingoes into the area. The way Jennifer describes the land and its surroundings is just beautiful. The flora and the fauna are mentioned in great detail, and it was one aspect of the book I really liked. For me, this book had it all. It is a story of hope and new beginnings, of love and friendships. It touches on important issues like racism, bush regeneration, and wildlife rescue. I really enjoyed reading Journey's End, and I would highly recommend it.